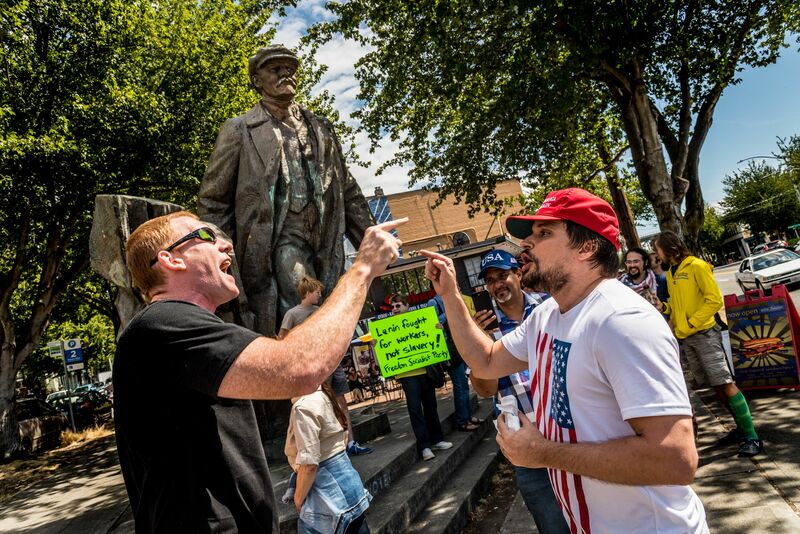 Yesterday, in a stunt about removing statues, a small group of alt-righters and Trump supporters decided to protest the infamous Lenin Statue standing in Fremont, Seattle, right near our home. The protestors failed to noticed a few big differences with the Robert E. Lee statue in Charlottesville, of course. 1. It's privately owned (and for sale) and on private property, 2. It's left hand has been repeatedly dipped in red paint to symbolize blood, paint that has not be removed and 3. There's a plaque next to it outlining very clearly Lenin's crimes and communism's tragic and brutal failures. But never mind all that, I propose a deal: Fremont removes Lenin, the alt-right removes the monuments to the Confederacy. The addition of the two actual Socialists, in the back ground of this image, defending Lenin made it a uniquely Seattle moment I think. The gentleman on the left was a passerby arguing about racism with one of the "MAGA" protestors. I was driving back from my storage unit when I heard about the kerfuffle, stopped and took a few images. I later emailed the Seattle Times later asking if they were interested and was told the paper had a "minimum threshold of attendance before we consider covering a protest" which makes sense in this town considering protests compete with the rain as part of our daily lives.